I find it difficult to begin any review about Arild Andersen without billing him simply as a “Norwegian bassist.” Succinct though the term may be, it hardly hints at the far reach of his fingertips, bow, and musical vision. A packed house felt some of that reach in the distance he’d so graciously traveled to bring his latest outfit to this year’s Rochester Jazz Fest as part of its “Nordic Jazz Now” series. While the cover of the Fest’s concert guide sported a collage of big names, headlined by Elvis Costello, Natalie Cole, k.d. lang and the like (ECM mainstay Bill Frisell could be found lurking among them), Andersen’s visage was nowhere to be found. Thankfully, this did nothing to deter an appreciative crowd from basking his warmth. The trio is an intermittent format for Andersen, whose underrated early date with Bobo Stenson and Jon Christensen, 1971’s Underwear, gave listeners a foretaste of the propulsion that continues to strum the heartstrings of his playing. Thirty-two years later found him alongside Vassilis Tsabropoulos and John Marshall in The Triangle, a distinctly pianistic record of gentler pulses in slower motion. Though Andersen was the heart of these outliers, his compositional beauties were reserved for his influential quartet—and quintet, via Masqualero—outings throughout the seventies and eighties. Where the Tsabropoulos project was threefold, Andersen’s newest trio with saxophonist Tommy Smith and drummer Paolo Vinaccia is hexagonal, for each musician is doubled by a modest array of digital equipment. The latter, along with the glitter of Vinaccia’s golden Pearl kit, was the first to catch my eye as I settled into my pew at the lofty church where the concert was held. Andersen’s bass lay prone on the stage, its tiger-grained wood at once regal and humble. Stained glass icons seemed to fix their gazes upon it as they opened their arms, wept, and tended to the ailing—an emotional tableau not unlike the performance we were all about to experience. On the morning of, I had awoken to the rather different tableau that is a pulled back muscle. Though it did little to squelch my anticipation for the day’s proceedings, it made getting there that much more uncomfortable. The muscle relaxants I took had rendered my body about as liquid as a phrase from Andersen’s bass. The effects had worn off by the time of his first evening set (sadly, financial constraints kept me from staying for the second), making sitting increasingly uncomfortable. It was in this state that I welcomed the sight of the trio ascending the stage. Andersen offered a few words to start, openly lamenting the infrequency of European jazz acts in the U.S., before Smith launched into a rendition of a Gregorian chant. Fed through a microphone and expansively echoed, his Mark VI tenor blossomed with such gorgeous depth that, once Andersen joined with his arco strains, any pain I had felt was immediately blown to dust. Andersen and Vinaccia then shifted gears into an arid soundscape with Masada-like flavor, Andersen’s smile forming the perfect bridge into the beautifully realized Norwegian folk song that followed. Here, Vinaccia played with what appeared to be small wicker brooms without handles. Over this staccato backing, Smith plied his most soulful highs (which sounded like a soprano), going from sandy to cloudy and back again in a flash. Andersen’s echoed bass wavered like a receding mirage, leaving us to ponder a lone turn from Smith, an entire desert in his embouchure. The cerebral groove of “Independency” (only Part 4 was played), written in 2005 for Norway’s centennial independence, unpeeled one of Andersen’s most captivating solos of the night and segued into his beloved “Hyperborean.” The title here refers to a mythical people with whom Apollo spent his winters in drunken revelry in a land without night—not unlike, Andersen quipped, Norwegians themselves. From the avian warbles of his bass to Vinaccia’s echoed brush-rolls, this piece sang of and through the heart. Smith’s exacting dynamic control was on full display, peaking in those soft, wooden highs. The band put us back on our feet with another folk song, “The Farm Girl,” even as it pulled the rug out from under them. Clouds of fire from each musician in turn delighted us before cooling with the vamp into fadeout. Last was “Dreamhorse,” a contemplative Andersen original with the watercolor bleed of a Kuára collaboration. The melodious exchanges thereof made for a fitting farewell. 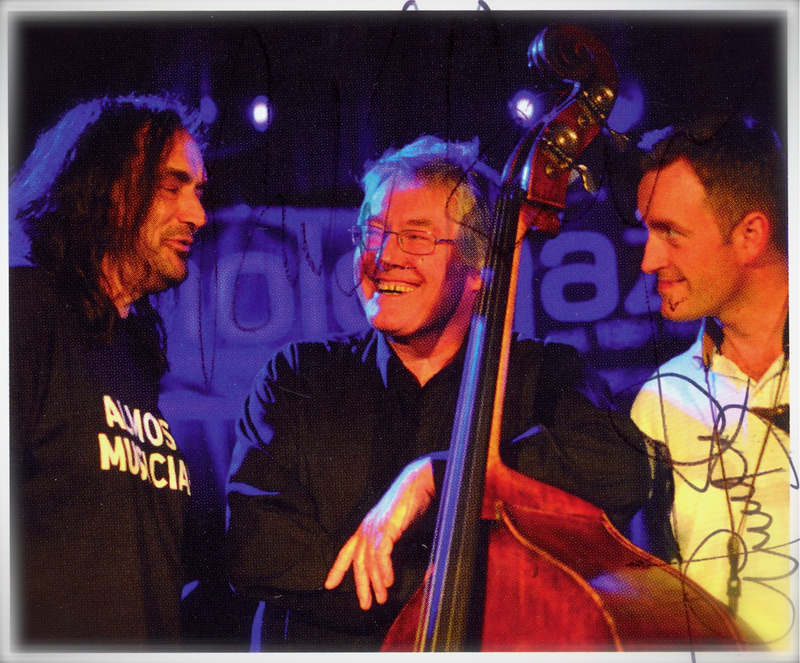 The music of the Arild Andersen Trio is not about showing off. It is about mood, reflection, and living in the moment. The bass may be Andersen’s voice, but songcraft is his forte. The opening stretch of “Hyperborean” alone was enough to wipe clean anyone’s slate free of critique. Smith was the tail to his dove. His cleanness of tone paid clear homage to Jan Gabarek even as it forged into distinctly personal territories. Vinaccia’s drumming brought a sound as organic as the dried plants with which he elicited it and was also a joy to hear in close quarters. With so many Fest events going on in succession, if not simultaneously, this evening show was a welcome respite from the day’s hurried atmosphere, and was a sonic gift of synergistic proportions. Thank you in kind, Yelena! I made it out to the Rochester Jazz Fest just to see him and came away with a cherished memory.